If you're a Darksiders veteran, Vigil Games wants to reward you. 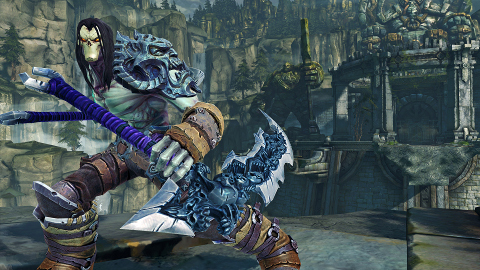 Any gamer who beat or played the game will receive bonus items for Darksiders 2 at no additional charge. The Pauldron of the Horsemen will be available to anyone who played Darksiders. The Pauldron is level 5 shoulder armor that beefs up all of Death's stats. It also helps his critical damage. If you beat Darksiders, you'll also get the Chaos Fang. It doesn't matter what difficulty level you completed it on. The Fang, a level 1 scythe, ups Death's damage and his critical strike damage. As you can see from the screenshot below, these items are very fetching. They're not fetching enough to make someone engage in a last-minute, Red Bull-fueled DS1 marathon, but they're nice nonetheless. It's clear that the art team put some effort into making these look special. The unlocks are based on your Achievements/Trophies. In order to earn the rewards for DS2, you'll need to play that game on the same platform that you played DS1. Hope you kept your save files.